For those of you who, like me, are self employed running their own small business, you know how much hard work goes into setting up. There’s all the “glamorous” paperwork side to do, notifying the Inland Revenue, arranging insurance, etc. 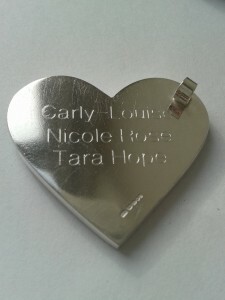 but there’s also the fun bits that let you stamp your own personality on your business – choosing your business name! For those who don’t already know, I named my business in memory of my beloved furry soulmate Lucylou. It seemed like a great way to remember a good friend, and so Lucylou Designs was born. When you’re several years down the line and trading happily, what do you do if you discover someone else has subsequently set up a business under a similar name? First step is don’t panic! If they are selling an entirely different product to you, then there is probably no need to worry, customers will realise you are not the same. However, if they are selling the same category of goods as you, then that is when things get tricky. You don’t want your customers buying from them in error, and you may not want your brand “diluted” by association with their goods if they are not of the same standard as your own. That is where a trademark comes in to protect your business brand. Your business name is classed as your trademark whether you have registered it with the Intellectual Property Office or not, but registered trade marks give you more rights under law, and make it easier to prevent others from using your name. I read lots of scare stories about how you really have to use a solicitor to register your trademark, but ignored them and did my research online, then completed the process myself online through the .GOV website for a fraction of the cost of a solicitor. It was straightforward if a little slow. After 4 months I was the owner of a shiny new certificate to prove that Lucylou Designs is my registered trademark for the next 10 years. This means that I am able to stop anyone from using that name to sell jewellery items, or a name that is confusingly or deceptively similar which may misdirect customers. If you’re sitting there thinking it is not worth the effort or expense, just consider what would you do if after 5 years of running the business you had built up from scratch, someone else came along and started using a really similar name. So similar that their customers were calling and emailing you by mistake. That’s what happened to me, and I can’t begin to tell you how pleased I am that I took those steps to protect my brand, my business, and my years of hard work! A simple cease and desist letter along with proof of registered trademark is all that was required to resolve what could have otherwise been a huge setback to my business brand. What a difference a little ® can make! So, what is the best way to break a true creative’s heart? That’s simple, a guaranteed way to break any creative’s heart is to say that their claim to their designs is a falsehood. That they are copies. That all they represent is fake. Not to say it to their face, not to lay your concerns at their door, not to even entertain for a moment that you could be mistaken only compounds the pain. Yet this is what happened to me, and why my heart is broken. When I saw the post on your page saying that you were being copied, I felt truly sorry for you. Your designs are always beautifully executed, and I felt your pain. It was only after I shared a design of mine, that your indirect response over your “original design” made the penny drop that you were talking about me! I was shocked, upset, devastated, and then I did the stupidest thing I could have done – I went back to your page and read the comments and accusations about me. It left me feeling sick to my stomach. No, my name wasn’t mentioned, but the attack on my character and my life (because yes, what I create here is part of my life) was so far from the truth I could have wept. Against my better judgement, a few days later, I read another post. 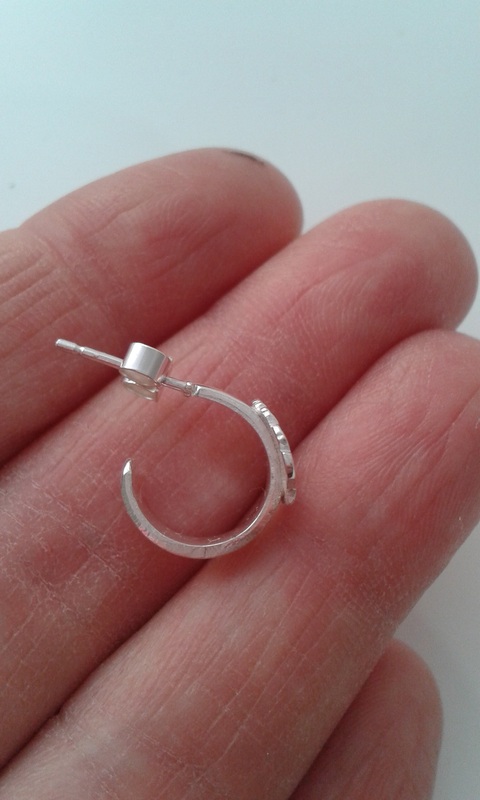 This time it was about how some people will never understand jewellery design. Once again it seemed aimed at me, an effort to diminish what I create, another arrow that found its target. So as you don’t know me, let me tell you who I really am. I don’t have a degree in jewellery design, what I do is intuitive and comes from my soul. It is created with love, passion and meaning and I wouldn’t change that for the world. I’m a sensitive soul, I feel others emotions, I worry about how they feel, and what they feel about me. I’m doing something I love. I create pieces that all have great meaning to me. I even name each hare because they all have characters and personalities that evolve during the design process – they are like my children. My style of design is recognisable through all my pieces: the progression and process is there for all to see, so if I were plagiarising you and others as stated, then this continuity could not exist. 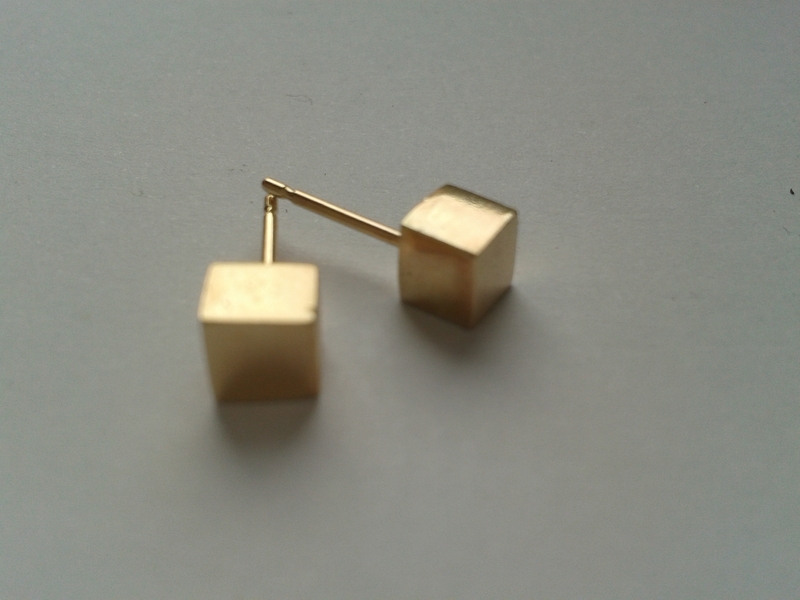 Jewellery is 80% design, and 20% engineering, an idea can only be constructed in a limited number of ways, so on occasions things may be appear similar. This doesn’t mean they were copied. Perhaps if you’d addressed me directly I could have put your mind at rest that my designs are all my own, but that didn’t happen. So since we had no opportunity for an open and honest private dialogue, I have responded in this way. I’m guessing that you must have felt hurt and angry and set out to say things that would make you feel better. I’m not sure if it worked, but I hope it did, because I have no wish for you or anyone else to feel upset. As a good friend said to me, there is already enough pain in this world , and I have no wish to add to it. I still think your work is beautiful, but I have a feeling I won’t be able to see it now without feeling that stab of pain in my soul. So from one creative to another, I hope you can understand why my heart is broken. A lot of people don’t know their ring size – not surprising really, we don’t buy as many rings as we do clothes, and while we may know one finger size, what about the others? 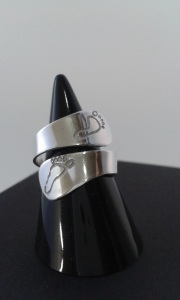 The best way to make sure a ring will fit is to have the finger properly sized at a jewellers using the ring sizer guides, or using one of the disposable plastic ring sizing guides that you can buy. If you want to buy someone a ring as a surprise and are not sure of their size and asking them is not an option then all is not lost! First of all make sure the jeweller you’re buying from says they can adjust it if it doesn’t fit…….it’s likely that if the ring contains a stone the jeweller may have to remove the stone in order to resize the ring, and this can be difficult. If you still want to go ahead with your secret squirrel mission (and you’re very brave!) then go ahead and try some of the methods mentioned above, I can’t promise they’ll work but perhaps worth a try? Remember – the best way is to have the finger properly sized. Good Luck! IMPORTANT! PLEASE MAKE SURE YOU DO NOT CLAIM GIFT AID ON THIS. IT IS NOT CLASSED AS ELIGIBLE UNDER HMRC RULES BECAUSE THERE IS A PRIZE INVOLVED. 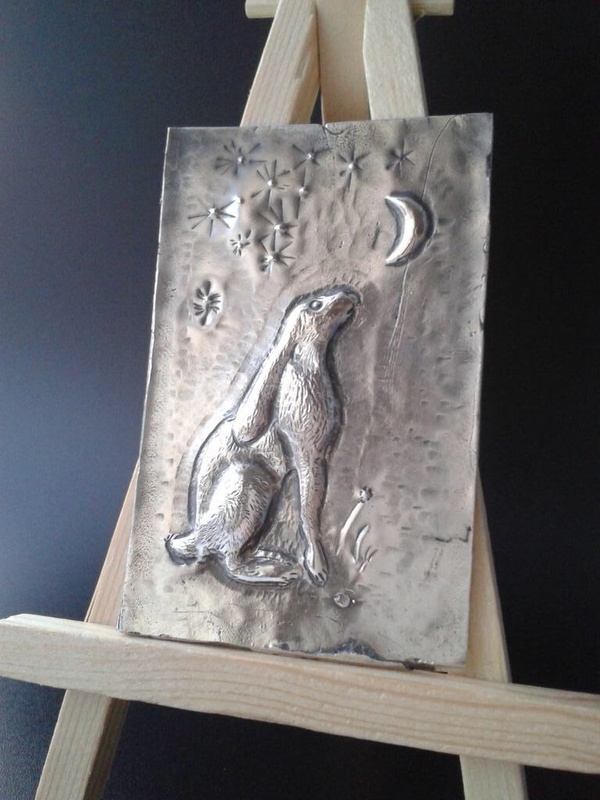 I am currently raffling this original solid silver mini picture of a moon gazing hare to raise funds for the DEC Gaza Appeal. The appeal is to raise funds for families who have lost everything and currently have no shelter, food, or access to basic life essentials and are living in intolerable conditions. It is not a political statement it is a humanitarian appeal. 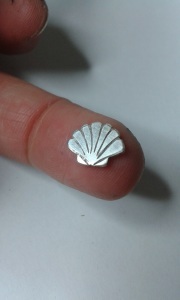 The picture measures approximately 80 x 50 mm and weighs in at over 40g of sterling silver. I made it using the traditional technique of chasing and repousse, which employs hammers and punches to stretch and shape the metal to form the detail of the picture. It’s usual retail price is £225 but you could be the lucky owner by winning the raffle! For a donation of £5 to my Justgiving page you get a “virtual raffle ticket” entered into the draw, £10 gets you 2 entries and so on. The draw will be held on 31st August. If you do donate then please be sure to leave your name on your donation at Justgiving, and also email me on [email protected] so I can get in touch with you if you’re the lucky winner! Visit my justgiving page to enter at https://www.justgiving.com/lucyloudesigns and remember to uncheck the gift aid box as this is NOT eligible. 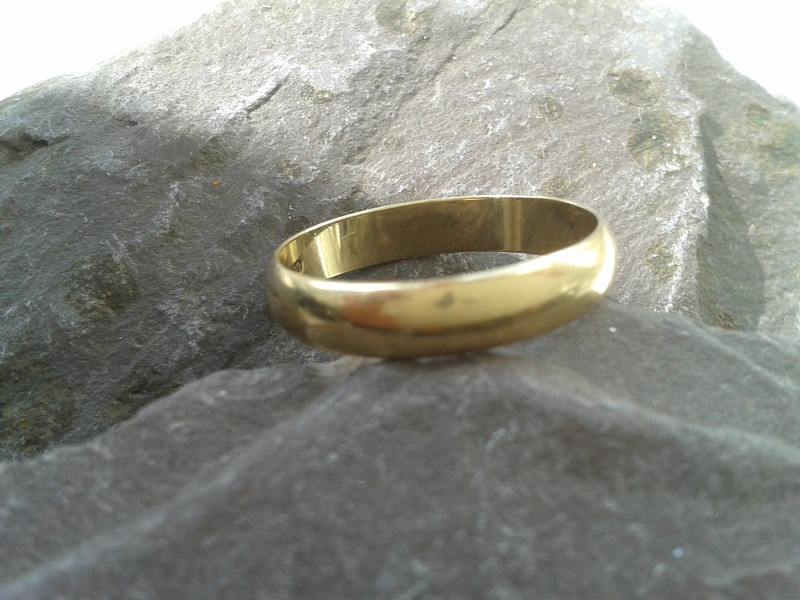 A while ago my Mum had her engagement ring repaired, and was given back the old broken ring shank. 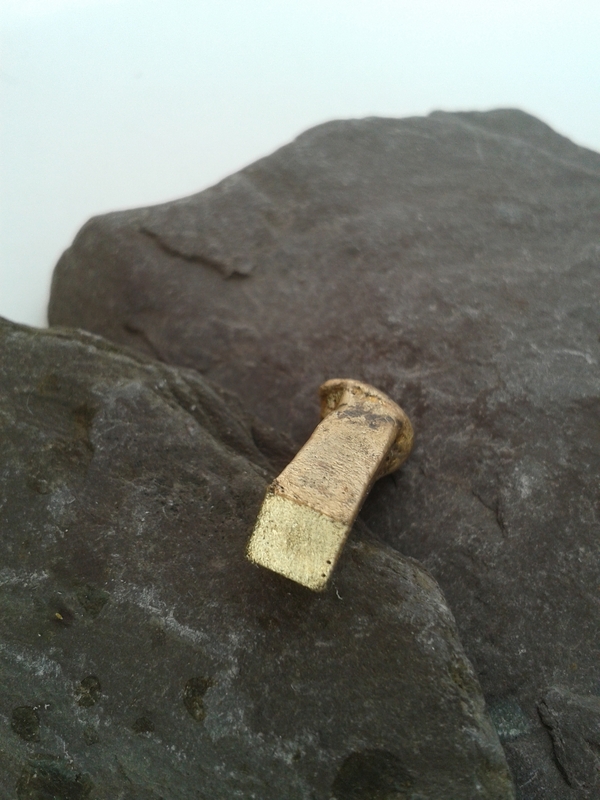 She was going to throw it away (18ct gold – oh my!!!) 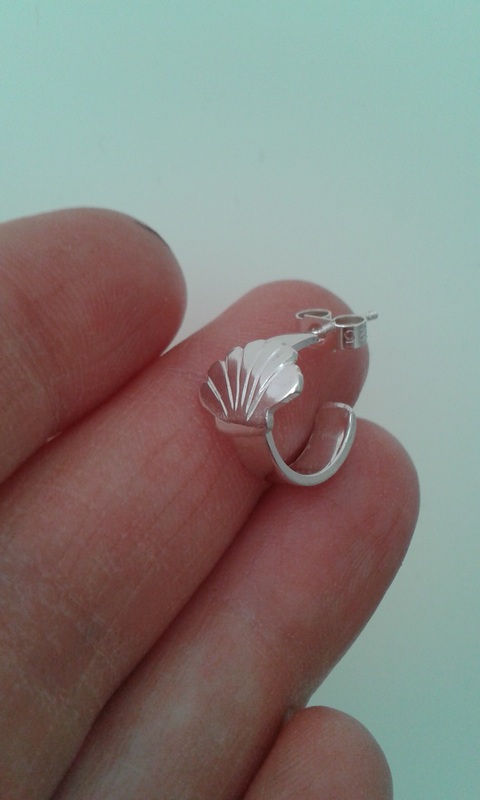 Luckily I stopped her, and instead made some earrings for her using the broken ring shank. Well, if anyone comments on her earrings she does the proud Mum thing (thanks Mum! x) and tells them about how I make jewellery – this is how I got my latest commission. A lady inherited her Father’s wedding ring when he passed away. As with many pieces that we inherit we can’t wear them either because they don’t fit, or they’re not a style that we would choose, so the piece languishes in a drawer. We keep them because of the sentimental value, but it would be so much nicer to wear them and have that reminder with us all the time. 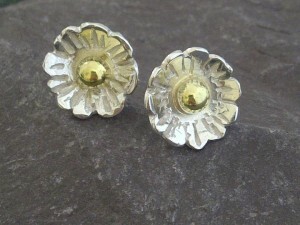 Having had the story from my Mum about the earrings (!) she asked me to make a pair of cube shaped earrings for her Mum’s birthday using the gold from the wedding ring. I duly melted the ring down, and cast it into a square section wire. The process takes a lot of time as it involves making a mould and casting the metal, in addition to a lot of cleaning up and filing of the gold to be done after casting, so it’s not a cheap way of getting gold jewellery, but it is an excellent way of recycling the memories from a piece of unworn gold. 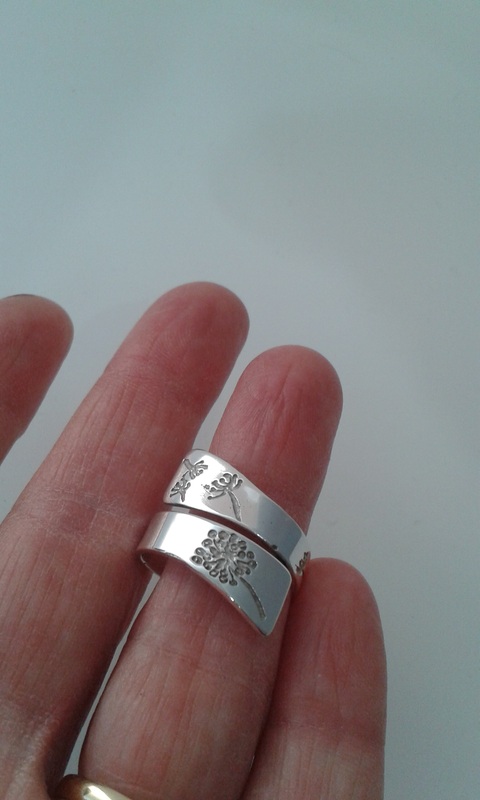 So recycling memories and gold together have made a very special piece of jewellery with so much sentimental value – what a beautiful gift from a daughter to her Mum. A heartwarming tale about commissioning designer jewellery! 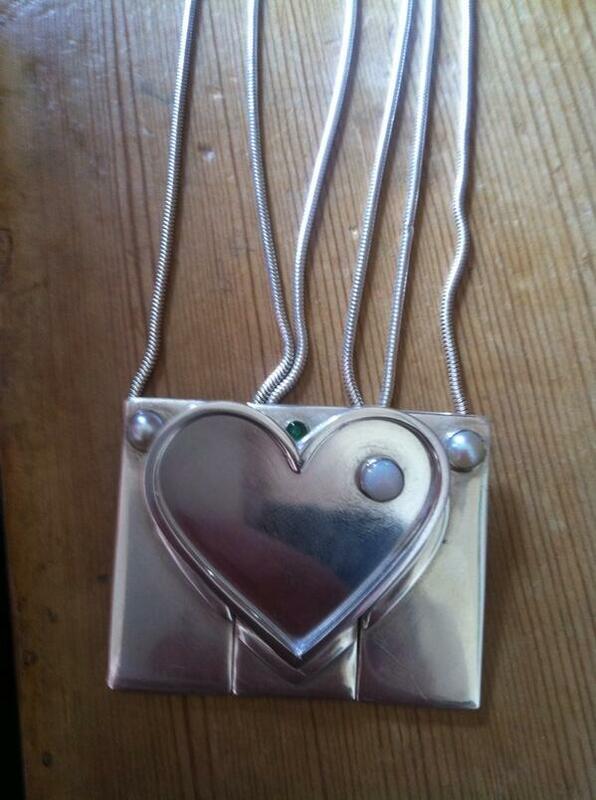 Last year I was asked to design 3 matching silver pendants for 3 sisters. Their Mum wasn’t sure exactly what she wanted, she knew she’d like the pendants to make some sort of special design when all 3 were put together, so I came up with these – 3 pendants set with birthstones which formed a heart when they all came together – to represent the bond between the 3 girls. 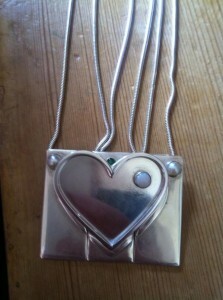 The three pendants, set with birthstones, form a heart when put together to represent the bond between the 3 sisters. 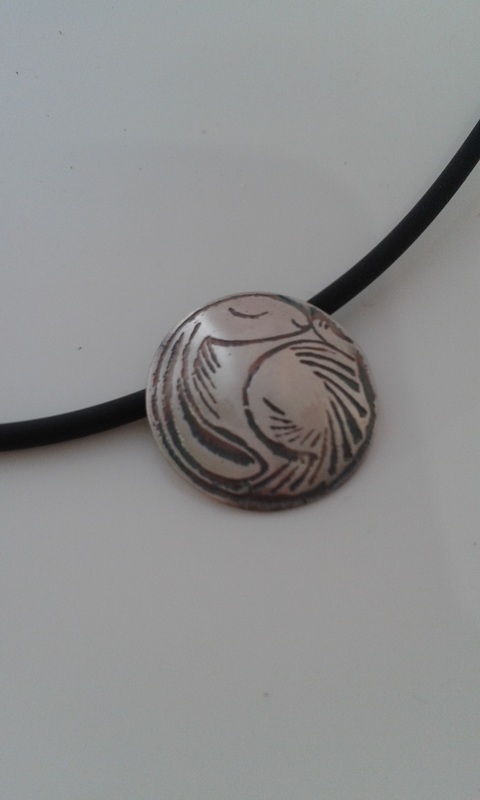 With the design accepted, I made the silver pendants, Christmas Day arrived and everyone was happy! The girls were delighted with their designer jewellery, and their Mum was so excited to have given them a unique gift full of meaning! 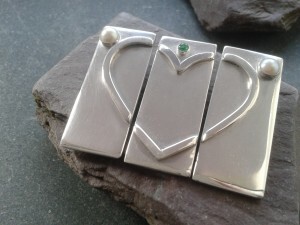 Well, with Mother’s Day approaching the girls pulled a surprise on their Mum and asked me to make a piece of designer jewellery especially for her. The design mirrors the heart element of their pendants, and is set with opal – her birthstone and engraved on the reverse with their names. 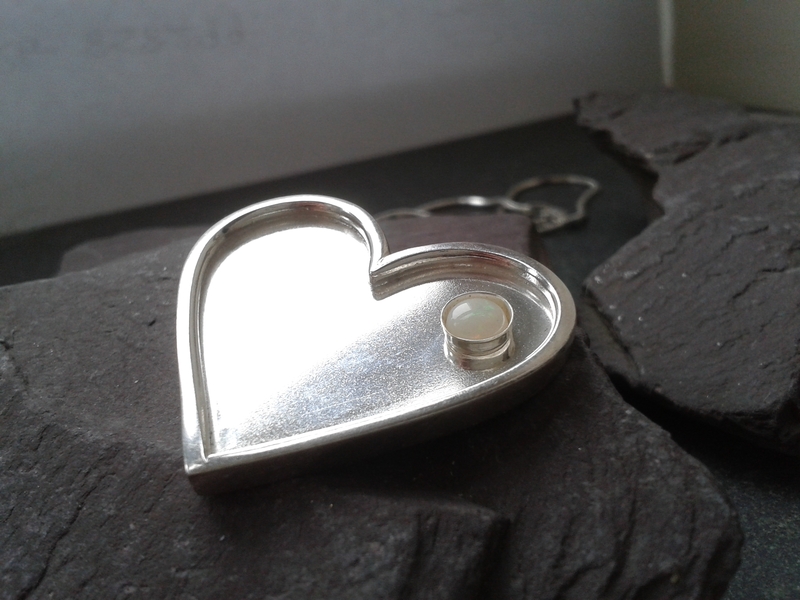 The heart on this pendant matches the heart that the daughters’ pendants form – this represents their love for a very special Mum. I have been bursting with excitement over this commission, and have been so looking forward to finally seeing the reaction from the lucky lady herself. 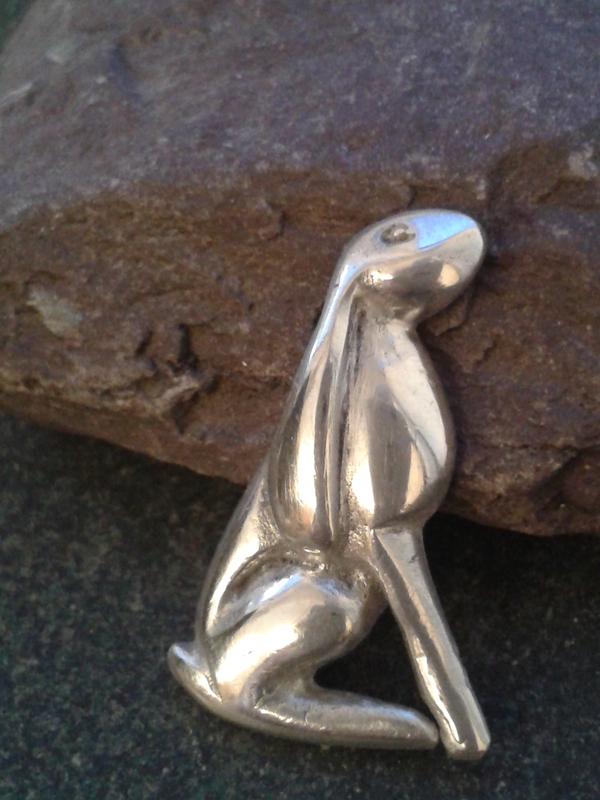 Well the waiting is finally over – she has just tweeted me a picture of her pendant on top of all the pendants together – I think she’s just a bit of a happy Mum. 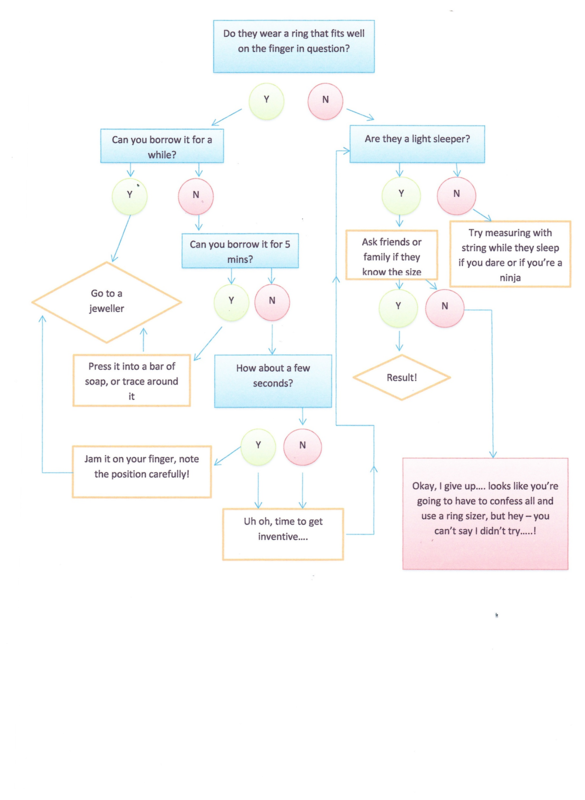 So, why not give it a go? You could get your own perfect piece of unique designer jewellery, beautifully made and full of meaning too. All the pendants together forming a great big heart! I’ve sometimes been accused of being indecisive. There- I admitted it! In my defence sometimes I am faced with just too many choices- I have been known to spend a full 5 minutes staring helplessly at the coffee shelf in the supermarket unable to make the final decision over Italian Roast, French full bodied, or Lazy Sunday style coffee. 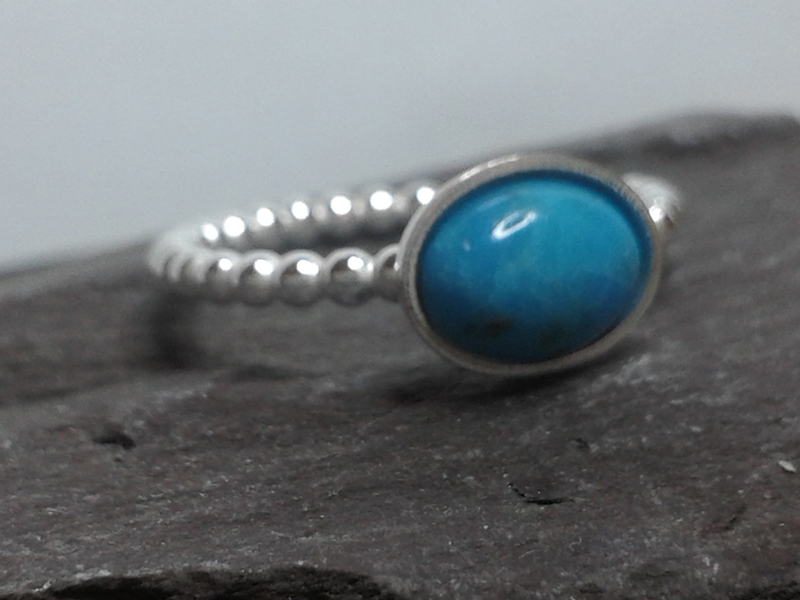 So you can imagine what I get like when faced with LOADS of beautiful stones to set in rings…. 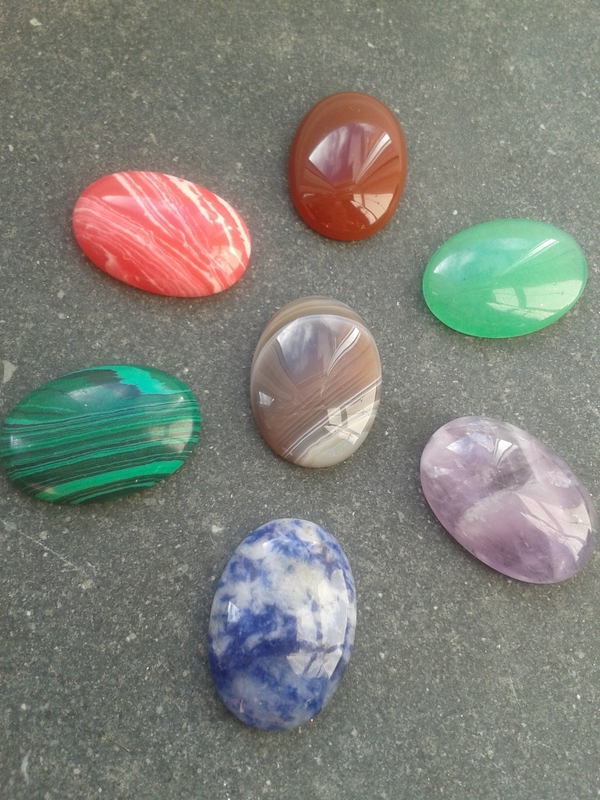 Yesterday, I was faced with such a choice – rhodonite, turquoise, carnelian or rhodocrosite (err, that translates as dark pink, turquoise, orangey red or light pink!!! 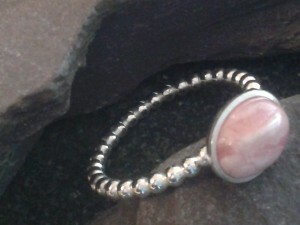 ), and then it came to me – don’t decide – make them all, and my new skinny rings were born! 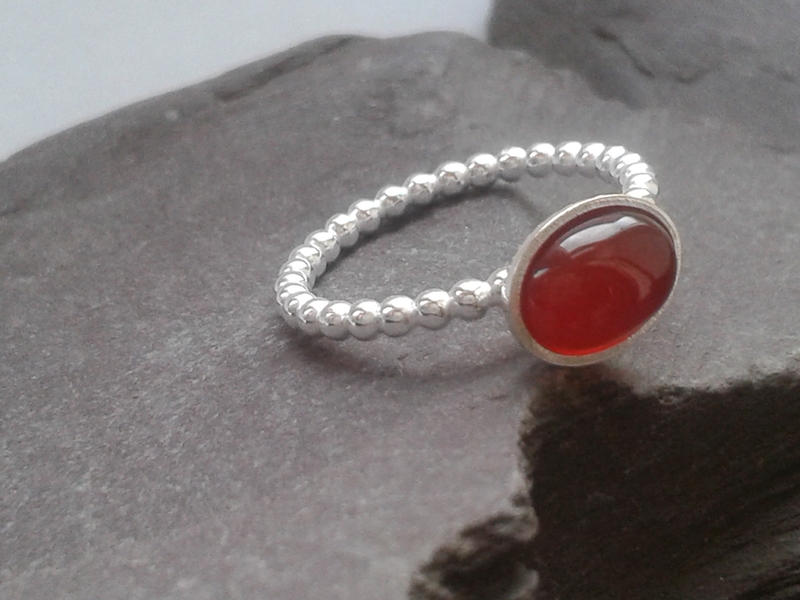 These handmade silver rings are made from sterling silver “pearl” wire which is one of my favourites and makes such a beautiful feature, and topped off with a small (but perfectly formed!) 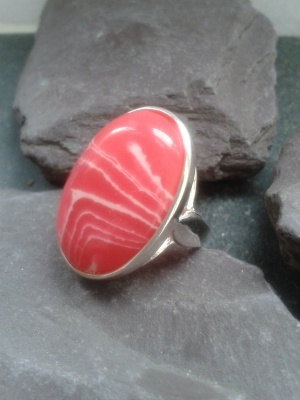 stone – they are definitely my new favourite piece of designer silver jewellery! I’ll be teaming these up with some skinny silver bands, so keep an eye on the blog for news of when these are going into my online shop. 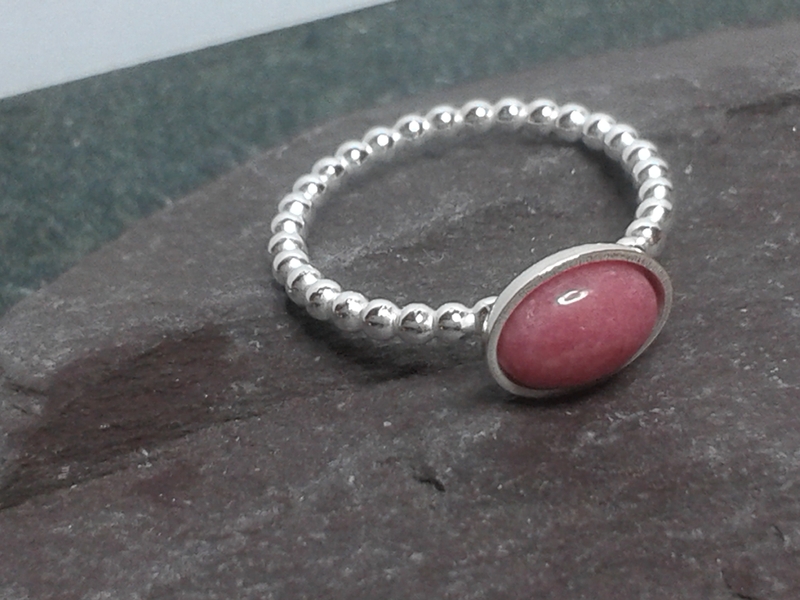 The great thing about these rings is that they are skinny enough to stack with other rings, or beautiful enough to wear alone, and will definitely be affordable enough to choose several in different colours – so you see – you don’t have to choose just one after all!!! Hello! Who needs cheering up? Well, me for a start…. too many dreary dark wet days for my liking, and not enough of the freezing cold sparkly ones that make your spirit soar and your cheeks rosy pink! You could win this handmade silver cocktail ring! I think there’s nothing like a good giveaway to raise the spirits, so I decided that one of my uber-glamorous handmade silver cocktail rings might just do the trick. 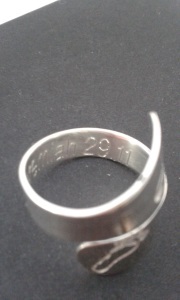 There’s no catch – one lucky person will be drawn at random from the entrants, and they will win one of these rings made to their ring size, by my own fair hands. I’ll even put it in a pretty box and pay the postage. All you have to do to enter is leave me a comment at the end of this blog – that means I will have your email address, so I can contact you if you are the super duper lucky winner! Closing date for entries is Sunday 16th February at 6pm, and the winner will be notified the following day. There is no cash alternative to the prize. 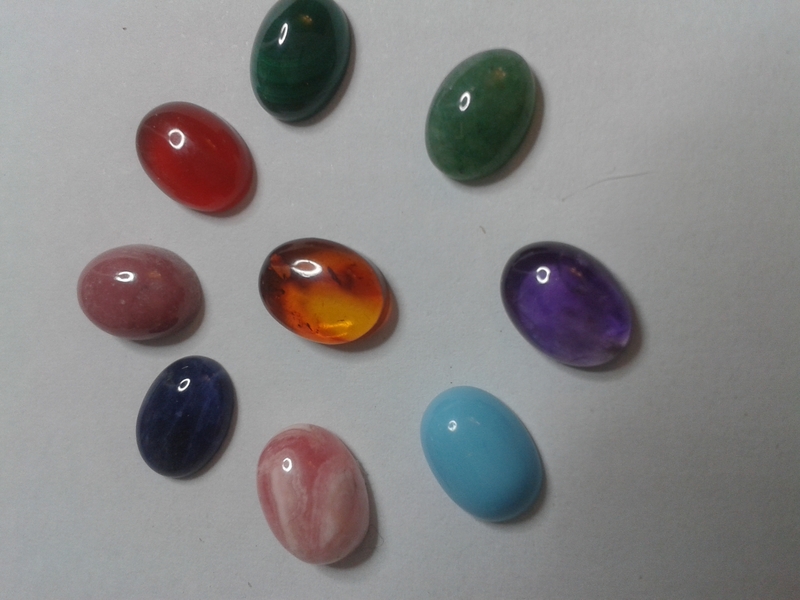 So go ahead people – leave me a comment – why not tell me what colour stone you want in your ring if you win? Or even tell me a joke!!! You can choose from these stones for your handmade silver cocktail ring if you’re the lucky winner! Over the last week or so I have been *slightly* obsessed with making tiny silver animals. Rather than hand piercing them from silver sheet I wanted them to be more realistic, and a bit more 3d so I decided to have a go! 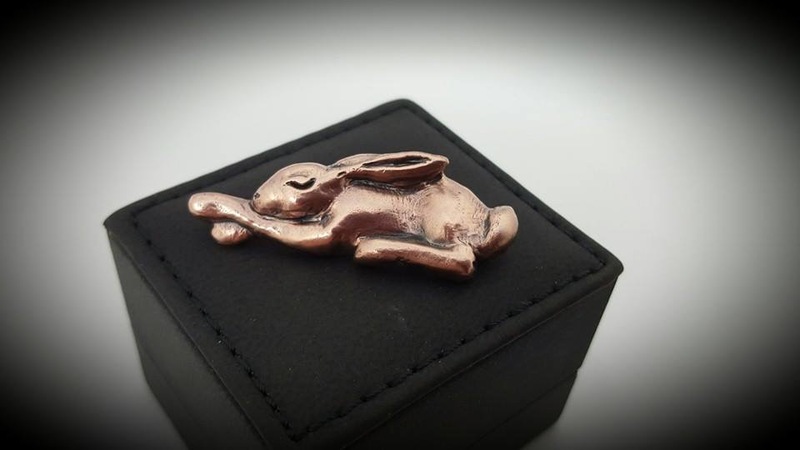 All too often nowadays people think it’s okay to simply make a mould from an item they’ve bought, and cast a piece from it – which is very simple since the invention of silver clay. Apart from all the copyright issues, where is the skill in that? 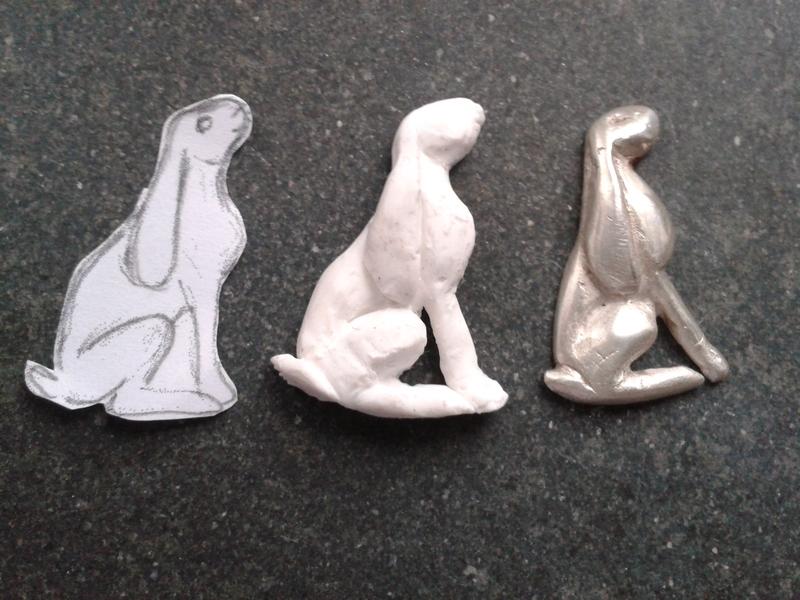 I decided that my animals were to be made from scratch, all handmade silver, 100% by me. 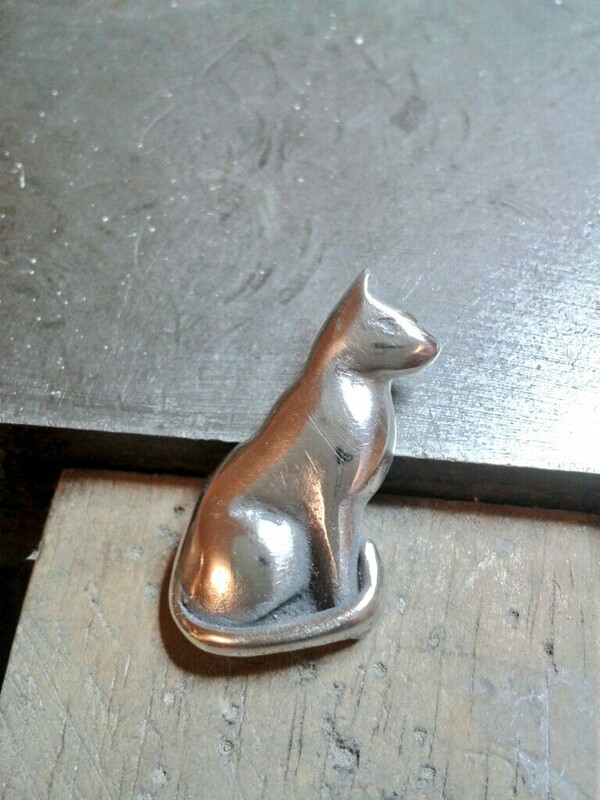 The final silver casting was still quite rough, so I spent many hours filing and sanding to get the contours and appearance right, then after a bit of polishing here’s the final result! 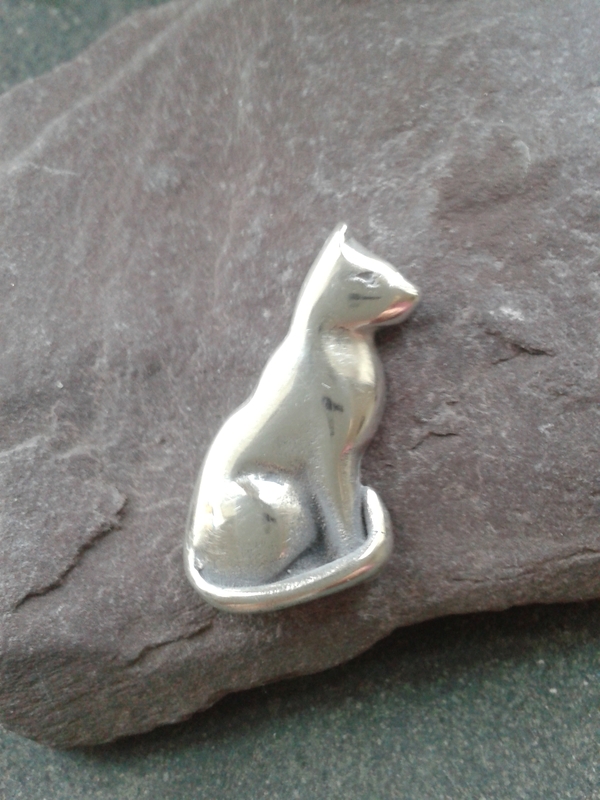 I’ve also added a cute little silver cat to the collection, made in the same way – she’ll make a fabulous pin or pendant. Alice – the silver cat!